Dark Souls 3's first piece of DLC is coming this October. Update 3: Bandai Namco has officially announced Dark Souls 3: Ashes of Ariandel. Head on over to our story to learn all about it! 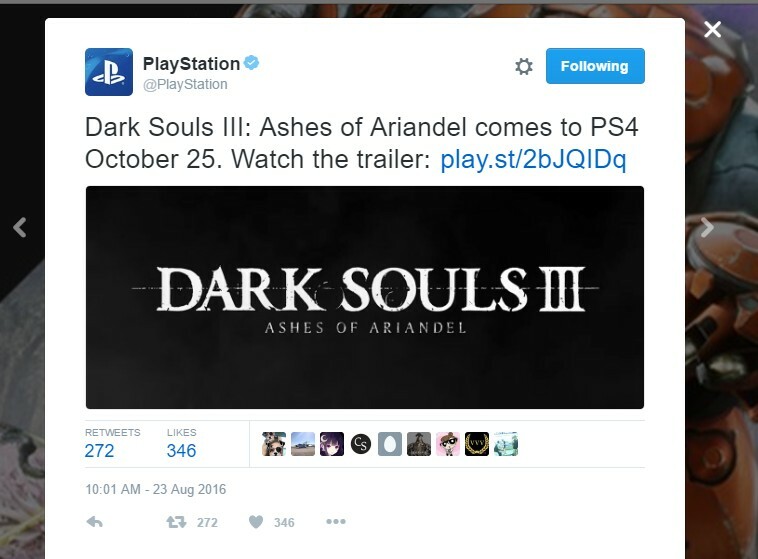 It appears Sony has leaked Bandai Namco and From Software’s big news scheduled to go out today as its Twitter account revealed Dark Souls III: Ashes of Ariandel will launch on October 25. The tweet points to its official trailer on YouTube, but at the time of this writing, it appears it has yet to be set live. We knew From Software would be making a big announcement this week, and given Sony’s tweet, it appears we were right to think it would be an announcement for Dark Souls 3’s DLC. While the tweet presents us the name of the DLC and its launch date, additional information is scarce at the moment as Bandai Namco has yet to officially reveal the upcoming expansion. Stay tuned as we plan on updating our story as soon as Dark Souls 3’s DLC announcement comes in.